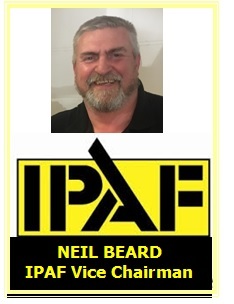 **** Our Managing Director – Mr Neil Beard is appointed IPAF Vice Chairman – CONGRATULATIONS ARE IN ORDER ! *We welcome another new Fork Truck Instructor Dave who has joined the KNT training team. ***** Bam Bam – our new rescue dog (Rottie) joins the KNT office in October – looking forward to having a four legged friend again! ****We were approached to assist in a funded project supporting businesses in the local area to deliver a wide range of technical skills training during Summer. -The project was a success and provided training in the following areas;- IPAF Operator, IOSH Managing Safely, Asbestos, Abrasive Wheel, COSHH, PASMA Towers for users. ***Additional courses now available at KNT accredited via ITSSAR – For the purpose of Inspection + ITSSAR Managing Forklift Operations. ****KNT training Ltd are continually supporting unemployment support programmes in our local community. We provide a supportive environment with dedicated staff members to enable a positive learning environment. Several programmes are reporting back to us an increase in job outcomes. **We have had a further classroom built to accommodate additional courses we are running and new business coming through our doors recently. We have also been running successfully in partnership IOSH and NEBOSH training. *We have 2 new full time Instructors KNT welcome Mick and John and several new Part time staff for IPAF PASMA and Fork Truck Training on board with us. **KNT have expanded and moved to larger premises and taken on a new Sales Person Miranda to assist with new business developments – available for appointments – contact the office to discuss your training needs with her – no obligation. *We have new Large indoor practical training areas • Clean, comfortable classrooms • Daily IPAF/PASMA/Fork Lift Truck courses • Free Parking/Easy access from the M1.